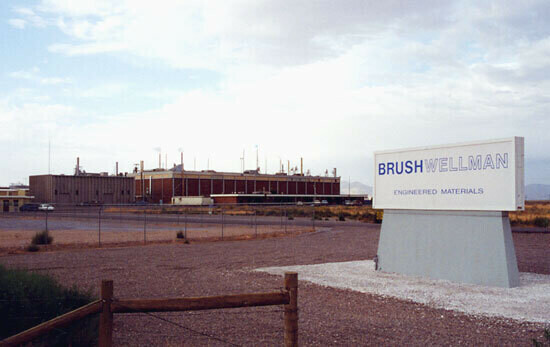 This large industrial plant in the remote Sevier Desert of western Utah is one of the only sources of concentrated beryllium in the world. The plant is a mill and finishing facility for beryllium, a high-strength, lightweight metal used in military, aerospace, and medical industries. The ore for the plant comes from Brush Wellman's mine, located in the Topaz-Spor Mountains, 50 miles west, which is North America's only developed source for the metal. The facility is located here due to the remoteness of the area, as beryllium dust is highly toxic, and the proximity of a large source of power: the Intermountain Power Project, a massive coal-fired power plant located a few miles away.